Inside a giant factory that was once abandoned – for too long, the LX Factory has everything to give you an alternative perspective of Lisbon. This part of the city that once was a place of old warehouses and factories, located in one of the worst and ugly areas of Lisbon – literally under the bridge, is now a welcoming space, packed with digital nomads and startups. This bookstore with 40000 books was originally founded in Bairro Alto in 1999. For me it’s one of my favourite and the perfect place to quietly read a book over a cup of coffee or a cold beer, while hearing a piano recital or even making time for a next door art exhibition. What I love here, is to see the magnificent mechanical structures that decorate the whole building, it’s strangely comfy and welcoming. One can sit down for hours just reading a nice book or relaxing for a bit while admiring the strange industrial interiors. 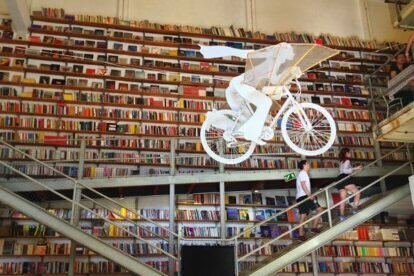 Looking up, there’s a moving bicycle with wings in the centre of the room from the Italian artist Pietro Proserpio – Sometimes he organizes a crazy exhibition of his creations with all sorts of waste materials, a kind of “Gepeto meets industrial”.